The Original Comic Book Universe! History! From the dawn of time to the present day, including historic DC characters like Arion, Lord of Atlantis, Enemy Ace, Black Pirate, and Sgt. Rock. Locations! From Gotham and Metropolis to Atlantis and Gorilla City, exploring every part of the modern day world of the DC Comics. Characters! 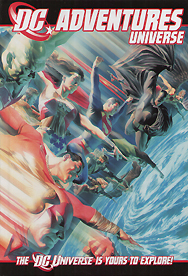 DC Adventures write-ups of over two hundred additional characters, including the New Gods, Batman Beyond, the Time Trapper, and the Amazing Zoo Crew! Space! Out beyond the Earth to distant worlds with the Lantern Corps, to the Vega System of the Omega Men, and the realms of the Khunds and the Dominators. Time! Into the future, from the Legion of Super-Heroes in the 31st century to the Justice Legions of the Year One Million to the Vanishing Point at the end of time itself! ...and Beyond! Across the Bleed to alternative Earths, the higher planes of the Fifth Dimensions, the realms of the Endless, and the gates of Heaven and Hell.